My research aims to understand the formation and evolution of stars and galaxies, and to place them in the context of cosmology and the large scale structure of the universe. Towards this goal, I am involved in the design and construction of cutting edge millimeter-wave and radio instrumentation and the creation of data analysis for that instrumentation. Z-Spec is a moderate resolution grating spectrometer for detecting molecular lines in local ULIRGs and carbon monoxide (CO) in high redshift galaxies. It covers the entire 200 - 300 GHz (1.6 - 1.0 mm) atmospheric window with ~1000 km/s resolution. 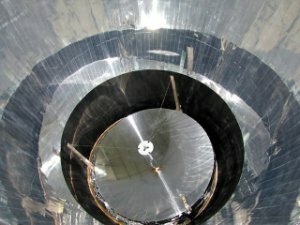 Z-Spec was fully commissioned during the spring of 2007 and observed routinely at the Caltech Submillimeter Observatory on the summit of Mauna Kea until May of 2010. Beginning in October 2010, Z-Spec operated at the APEX telescope in Chile as a guest instrument, and will return to the CSO in early 2012. Z-Spec has made a number of important discoveries, including a massive quantity of water surrounding a distant quasar and the determination of distance for gravitationally lensed dusty starburst galaxies. 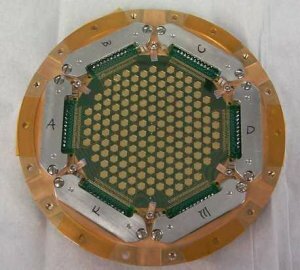 The Precision Array to Probe the Epoch of Reionization (PAPER) is an instrument designed to detect a signature of the first stars and galaxies. It does this by detecting the voids produced in emission from neutral hydrogren (HI) as these first stars ionize the previously-neutral universe. PAPER is an interferometer operating from 100 - 200 MHz (near FM radio frequencies); one of the antenna stations is shown at left. 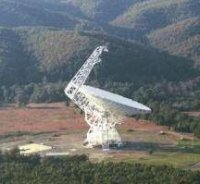 PAPER currently has a 32 antenna test station operating in Green Bank, West Virginia and 64 antennas deployed at the SKA South Africa site in the Karoo Desert. We will eventually deploy 128 antennas to the South Africa site. 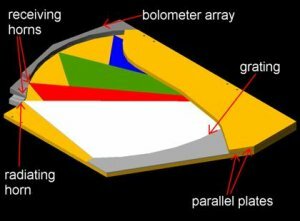 MUSTANG - a 3 mm bolometer array camera for the Green Bank Telescope. The Bolocam Galactic Plane Survey. A 1.1 mm continuum survey of the First Quadrant of the Galactic Plane and selected fields in the Outer Galaxy. 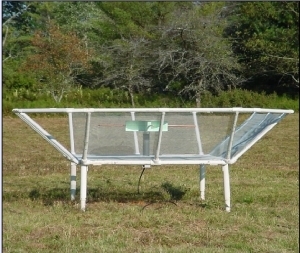 Bolocam has also been used to search for distant, dust-enshrouded star forming galaxies. There are two deep fields, the Lockman Hole and COSMOS. The Lockman Hole maps are available from IPAC. My thesis work was on TopHat, a balloon-borne telescope designed to measure anistropy in the Cosmic Microwave Background (CMB) radiation.